There are a few things that little ones are great at. Imagination, stealing our hearts, and MAKING MESSES! Of course, some adults (myself included) are pretty good at making messes, too. Ruthie here at Arizona Oriental and the trick you really need to understand is this: Messes are only one spill, muddy step, or sick child away from ruining your fine area rug. PREPARING for the unavoidable spot and emergency spot cleaning is critical to achieving good spotting success. Today, I thought I would share a few simple tricks to keep you ahead of the game. How you play the game can make all the difference – either by removing the spot or ruining the rug! Hide a white towel! Seconds count, so being prepared before a spill happens can make all the difference. Place a white towel under your sofa cushion for quick access. The faster you can get up excess fluid, the more you will be able to successfully remove the spot. Don’t rub! We at Arizona Oriental have seen small spots turn into nightmare-sized huge spots. Never rub a spot! It is highly likely that you will only make the spot twice as big. Instead, blot the spot and work from the outer edges towards the center of the spot. Have the correct spotter on hand! With fine wool rugs, you never want to use a harsh spotter that was developed for nylon wall to wall carpet! At Arizona Oriental & Specialty Rug Care we have a great spotting kit that is WOOL SAFE and carries the WOOLSAFE APPROVED LOGO. This ensures our clients that they are using a spotting product that will help them remove the spot and not make it worse or damage the fibers. If you don’t love your fine area rugs, then you don’t need this kit. 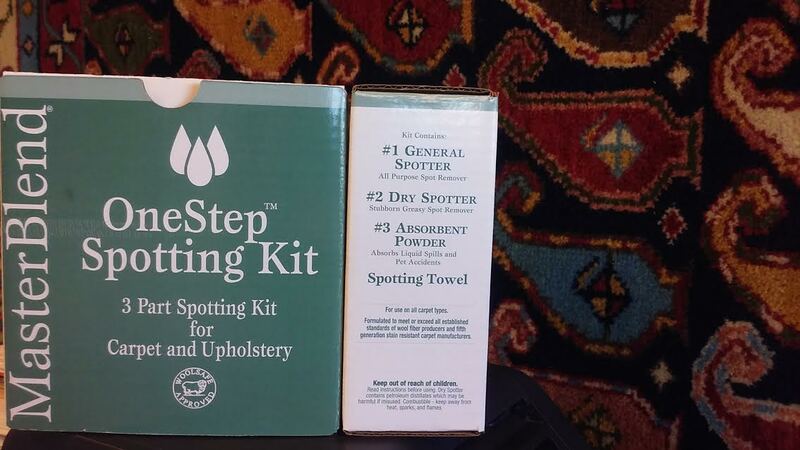 But if you DO love your fine wool rugs, then you DEFINITELY NEED THIS KIT! If there are any remaining spots or residue after giving it your best shot, don’t hesitate to call Arizona Oriental & Specialty Rug Care in Prescott AZ for further cleaning. Once again, time matters and you don’t want to leave that spot in your rug for very long. The longer it stays, the more likely it is that permanent damage to the fibers will occur. Call us for additional information on tips to properly spot clean your area rug and quotes at 928-445-1718, visit our website at www.ArizonaOriental.com, or stop by Monday through Friday 10:00 am to 5:00 pm at our rug washing facility at 565 EZ Street, Prescott, AZ 86301 (pick-up and delivery also available).